Joseph Albers (1888-1976) is considered one of the fathers of Optical Art. A contemporary of M. C. Escher (1898-1972), he too was fascinated with the geometric form. While work of Escher became a staple of mathematics education, because of a variety of tessellations in the Euclidean and hyperbolic planes that he produced, his impossible figures are much less known to both teachers and students. The same holds for the work of J. Albers who's been creating impossible shapes in the 1950s. The applet represents one of his creations, Structural Constellation (1953-1958). 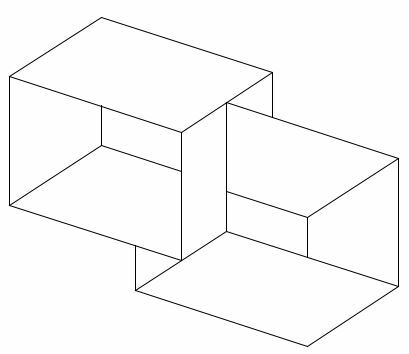 The shape reminds strongly of the Necker cube and an ambiguous staircase, each of which could be seen from two view points. 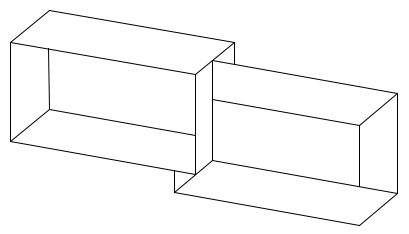 In the Structural Constellation, Albers forces the two views into a single creation, thus coming up with an impossible figure.